Drums are probably the oldest musical instrument that humans use. (Maybe even older than voice!) Likewise, only of the earliest childhood experiences is the cause-effect relationship of hitting something and the resulting “bang”-sounds. Hit, hit, hit – bang-bang-bang, and you got music; at least in some people’s ears. Music Explorium takes these ideas a step further and allows kids and adults to explore music in a variety of ways, from kids birthday parties to corporate retreat drum cycles. Every second Saturday, they are hosting a Family Rhythm Jam. 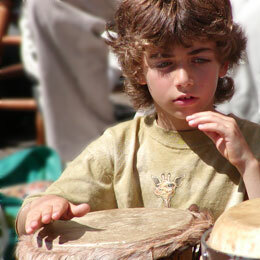 Kids (3+) can explore the feeling of rhythm with a variety of percussion instruments and drums. Music Explorium is less than half an hour from downtown Raleigh on Hwy 40. (One exit before Southpoint.) I haven’t been myself, but I’m looking forward to checking it out when my boy turns three. Family Rhythm Jams take place every second Saturday of the month from 10-11. Kids 3 and older only. This entry was posted in Active, Indoors, Music by daddyweekly. Bookmark the permalink.